OverviewBased on William Gibson's Neuromancer, Shadowrun for the Genesis is a darker, grittier, and more open-ended game than its counterpart on the SNES. Shadowrun for Sega Genesis is a little-known game and one of the last released for the console that is based on the RPG of the same name FASA and that has very little to do with his much more popular brother of SNES and Mega Drive. Now you can add videos, screenshots, or other images (cover scans, disc scans, etc.) for Shadowrun (USA) [Hack by Magus77 v2.2] (Conversion Mod) to Emuparadise. Do it now! If you haven't noticed yet, we have a retro game of the day feature (top-right of the screen) wherein we feature a new retro title every single day! Now, you can vote for your favorite games and allow them to have their moment of glory. 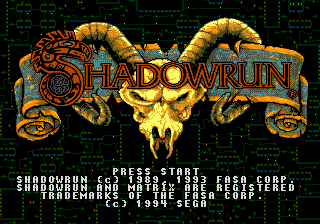 Click on the button below to nominate Shadowrun (USA) [Hack by Magus77 v2.2] (Conversion Mod) for Retro Game of the Day.